Brooks Dodson is the director of sports turf and grounds for The Denver Broncos Football Club, in Colorado, and that is no small feat. He is responsible for approximately 26 acres of property at the UCHealth Training Center — the corporate headquarters of the Denver Broncos. Therefore, when winter rolls around, he is the one responsible for the highly valued football stars’ safety — players who cannot afford any slip-and-fall accidents that would require them to sit out the entire season. Add to that mix the amount of media, staff and fans that visit the property and come through the center’s doors. Walkway safety is a must. “Getting everyone in, out and around the facility safely is our responsibility, and we take that seriously. We don’t want anyone hurt,” said Dodson. As a result, every year, Dodson’s facility staff would bring out the calcium chloride — various salt deicers — and apply it with a spreader or a cup to prevent slippery walkways. However, the rock-salt product residue was often tracked indoors, damaging carpets, tiles and concrete in and around the buildings. “When you are handling or spreading bags of ice melt … you can smell it, and if the wind is wrong, it’ll get in your mouth and you can taste it. I don’t know about you, but I prefer not putting that type of stuff in my body,” Dodson added. He decided it was time to seek out a more environmentally friendly product — in the form of a liquid. Dodson attended the Sports Turf Managers Association trade show last winter and found just that in SynaTek’s Entry. Entry breaks down hydrogen bonds formed when water freezes. As a result, once the product is sprayed, it removes thin layers of ice and snow, and prevents new snow from accumulating or icing. Entry reduces the freezing point of water to approximately minus 63 degrees Fahrenheit. 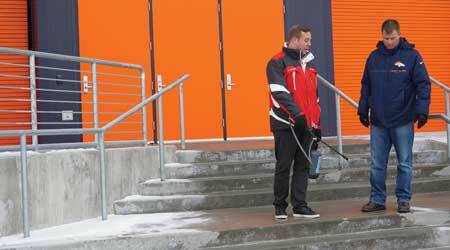 In addition to the newer liquid form of deicing being cleaner and faster acting, it is also environmentally friendlier — since Entry is easily biodegradable, and chloride and urea-free, it doesn’t damage the ecosystems — which is important to the Denver Broncos facility manager. Entry is used all around the UCHealth Training Center, specifically at entryways, on concrete steps and sidewalks, and in front of the team store that garners a high amount of traffic. In fact, although the Denver Broncos stadium is located 25 miles north of the UCHealth Training Facility, its operators caught wind of Dodson’s use of this new liquid deicer and its benefits, and now they are picking up the product to use for the stadium, according to Dodson.